It seems no matter how poorly the economy is doing, there are always jobs for the Attorneys to do. Audio engineering and technology firm Dolby is suing RIM in the U.S and in Germany, for infringing upon patents owned by the former. Dolby says that RIM has stepped over the line with many BlackBerry products, including the new PlayBook tablet and with BlackBerry smartphones. Dolby seeks a halt to all sales of the infringing products and seeks monetary damages for the past use of the unlicensed patents. 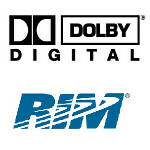 Even though RIM has allegedly been using Dolby's patented technology for some time, the latter decided to file the lawsuit in the U.S. District Court for the Northern District of California, saying that litigation was its last resort after RIM decided not to pay for the use of Dolby's technology. A similar suit was filed in Germany in the District Court of Mannheim. According to the papers filed by Dolby, RIM was using technology that belonged to the audio technology firm that, through the use of Digital Audio compression, allowed manufacturers to put high quality audio in their products even while using limited transmission and storage space. Dolby claims that RIM used this technology in the new BlackBerry PlayBook and in its BlackBerry smartphones. According to the suit, all other smartphone makers have paid Dolby to license the technology into their products. Dolby's technology allows smartphones and tablets (as well as other portable, digital players) to play back music and other digital audio that has been compressed to less than 10% of its original size. Dolby's patents have been incorporated into the International Standard known as High Efficiency Advanced Audio Coding (HE AAC). Ha! This is the year of lawsuits! It seems no one is willing to innovate but litigate. And why not devalue company stock at the same time, to make it perfect target for an acquisition. I would like to argue back, but at this point poor RIM is going to use whatever money it gets from it's Playbook to fight off or settle lawsuits. Good thing it has gotten those new Bolds, the Torch 2, and their 3.7" touchscreen device out to get them some cash flow and compete with all the other manufacturers phones while keeping their loyal fan base happy. Wait a minute, you mean THEY STILL HAVEN'T? ARE THEY STUPID OR SOMETHING?? ?